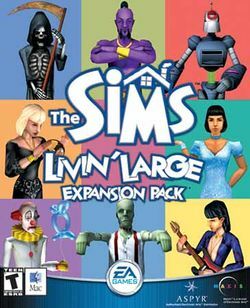 The Sims: Livin' Large (known as The Sims: Livin' It Up in the UK) is the first expansion pack released for the computer simulation game, The Sims. The pack includes new characters, careers, items, and features. If a Sim prepares a plate of cookies near a Christmas tree and a fireplace, Santa Claus might visit if all Sims in the household are asleep by midnight and leaves presents under the tree. Sunny visits the houses of depressed Sims who owns a Tragic Clown painting in their household. The clown makes tasks even more difficult for already miserable Sims by waking Sims while they're sleeping, and distracting them with poorly executed tricks. The clown can be eradicated by boosting the moods and overall morale of any Sims residing in the household and selling the Tragic Clown painting. Causing the painting to catch on fire will also cause the clown to catch alight. The fastest method is calling a service called the Clown Catchers (which look a lot like The Men in Black). The Grim Reaper collects souls of dead sims. If any adult Sims are close enough, the adult Sim can interact with the Grim Reaper and spare the life of a dying Sim, regardless of age. From there, the Grim Reaper can accept or decline the offer. If the Grim Reaper accepts, he and the adult Sim play Rock, Paper, Scissors. A win for the Grim Reaper results in the dying Sim to die anyway. A tie will result in the creation of a zombie. The zombie Sim will have a teal skin tone and their personality will be lost, but can still walk or run like a normal Sim. A win for the adult Sim result a complete resurrection of the dying Sim, with skin tone and personality intact. Livin' Large came with many new furnishing objects, such as a crystal ball, electric guitar, chemistry set, and magic lamp. Some of the objects had new NPCs associated with them (for example, a genie would appear from the magic lamp). Allows players to establish 8 neighborhoods. This page was last edited on 10 January 2010, at 21:15.